It’s that lovely time of year when we look at our burgeoning post-Halloween leftover candy stash and ponder one of two things. Number one: Halloween as we knew it is over, folks. I was at my Grandma’s house on Friday evening and she got TEN kids, only two-thirds of which were even dressed up. My Mom got TWO. I couldn’t believe it. I remember travelling with packs of kids on Halloween night, filling up my pillowcase to the brim, stopping off at home to drop my first round of treats there and then going back out to re-fill it again. My mom would go through our loot at the end of the night, making sure everything was safe to consume and the only things I really remember not being allowed to have were the popcorn balls from people we didn’t know. Which were far and few between because when you live in a town of 600 people, everybody knows everybody. This year all I heard about were kids not wearing costumes to school because they aren’t allowed, parents taking the candy away and replacing it with something else and even community events that totally avoid trick-or-treating. Which brings me to number two: If kids aren’t trick-or-treating anymore, what the heck are we supposed to do with all of that extra candy? My answer is always to re-purpose it into another treat, sometimes baked, sometimes not. This bark was the result of a recent baking cupboard clean out and it strikes that perfect salty sweet balance with lots of texture. Every piece is totally different, which I love and this is totally customizable with whatever you have on hand. Just don’t forget to add in some salty snacks to keep things from getting too sweet. 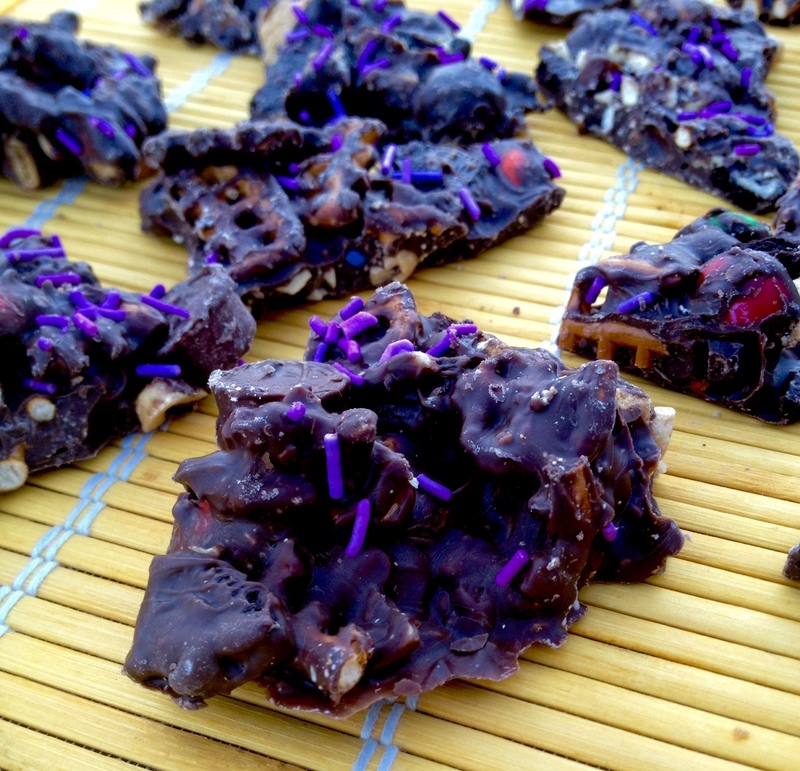 Yes, I took lots of treats and covered them in chocolate. Join me? Cover a large baking sheet with parchment. 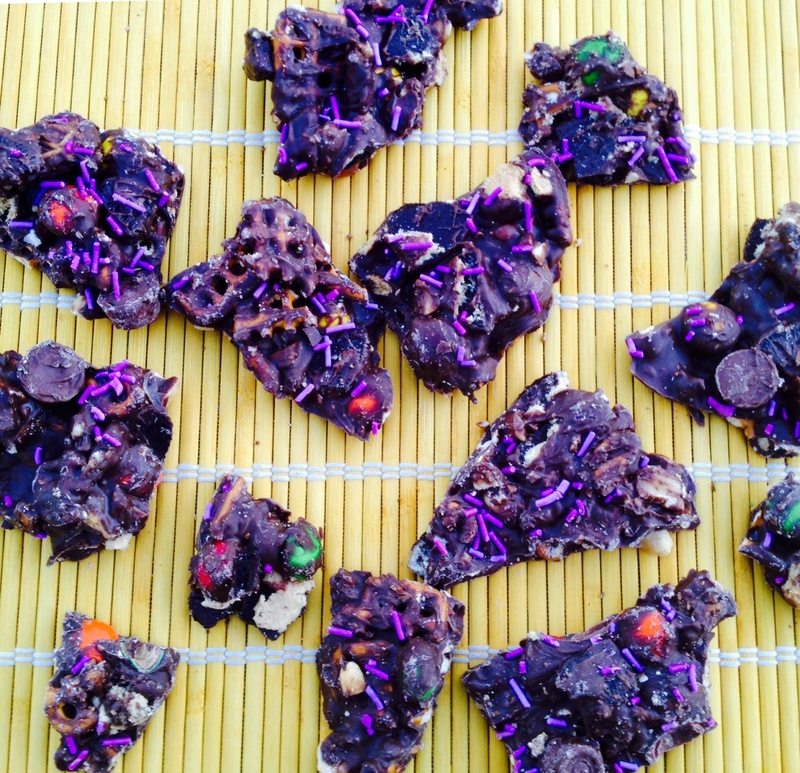 Mix together your chopped candy, nuts, cookies and pretzels and spread over the parchment in an even layer. Pour the melting chocolate into a medium saucepan over low heat. Heat the chocolate until it is entirely melted and smooth, stirring often so it doesn’t burn. Once it is melted, remove from heat and drizzle over the other ingredients on the prepared baking sheet. Toss if needed to make sure all of the ingredients are coated in chocolate. Garnish with sprinkles, if desired. Put in the refrigerator for 30 minutes or so until chocolate is set. Break the bark into pieces. Store in an airtight container.